Sridevi Birthday ,Remembering the Legendary Sridevi on her 55th Birthday celebration. Home Trending News Celebrity Sridevi Birthday Anniversary,Remembering the Legendary Sridevi on her 55th Birthday celebration. Sridevi Birthday Anniversary,Remembering the Legendary Sridevi on her 55th Birthday celebration. 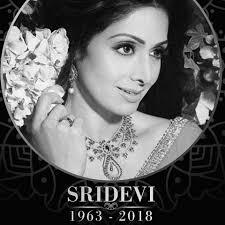 Remembering the Legendary Sridevi (13 August 1963 – 24 February 2018 ) on her 55th Birthday celebration. Sridevi (born Shree Amma Yanger Ayyapan) was an Indian actress and film producer, who starred in Tamil, Telugu, Hindi, Malayalam, and Kannada films. She was referred to as Indian cinema’s first female superstar . She was born on 13th August,1963 in Meenampatti,Sivakasi,Tamil Nadu,India. In a Year 1967,At the age of 4,Sridevi made her debut as child artist in a Tamil film “Kandhan Karunai” , and started her acting career in lead role as a child with M. A. Thirumugam’s in 1969 mythological Tamil film “Thunaivan” and continued to act as a child artist in Tamil, Telugu, Malayalam and Kannada films. In a Year 1972,She made her Hindi film debut as a child artist in “Rani Mera Naam” and In a Year 1976,At age of 13,She played her first adult role with the Tamil film “Moondru Mudichu”. In a Year 1979,With a drama film “Solva Sawan”, Sridevi startec her first starring role in Hindi cinema and she received wider recognition with the 1983 film “Himmatwala”. She quickly established herself as the leading actress of the industry after starring in a string of successful films, including “Mawaali” (1983), “Tohfa” (1984), Naya Kadam (1984), Maqsad (1984), Masterji (1985), Karma (1986), Nazrana (1987), Mr. India(1987), Waqt Ki Awaz (1988) and Chandni (1989). She received praise for such films Sadma (1983), Nagina (1986), ChaalBaaz(1989), Lamhe (1991), KhudaGawah (1992), Gumrah (1993), Laadla (1994) and Judaai (1997). Following the role of the titular protagonist in the television sitcom “Malini Iyer” (2004–2005), Sridevi returned to film acting in 2012 with the successful comedy-drama “English Vinglish”. She then starred in her 300th film role in the 2017 thriller “Mom”. Her Father Name is Ayyapan Yanger and He is a Lawyer by Profession.Her Mother Name is Rajeswari Yanger. In a year 1985,she got married with Mithun Chakraborty however, her marriage with him didn’t last long as they got separated in 1988. Then In 1996 she got married with Boney Kapoor. She got various awards in her careers like Fimfare Awards, Kerela State Films Awards,Nandi Awards,Screen Awards,Big Star Entertainment Awards,Stardust Awards and Many more..
Sridevi Birthday Anniversary. Remembering the Legendary Sridevi (13 August 1963 – 24 February 2018 on her 55th Birthday celebration. Previous articleSunil Shetty birthday celebration on 11th of August.